School yearbooks can be a treasure trove of genealogical information. I found that to especially be the case as I researched my 1st cousin 2x removed, Chester Jospeh Stuve (1913-1978). 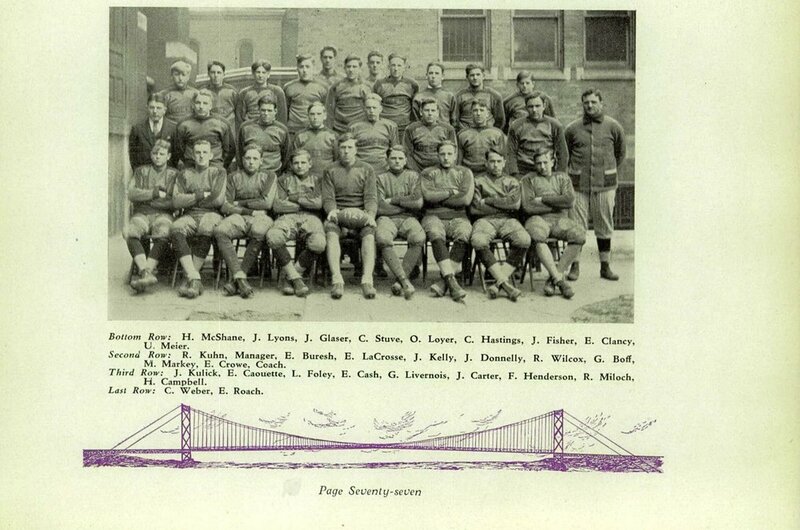 Here is a photo of Chester in the 1932 yearbook of Holy Redeemer High School in Detroit, Michigan. Chester was described as, "A good-natured fellow, an enthusiastic athlete, and a diligent student." Chester is the son of August Frank Steve (1888-1966) and Cecilia Grzeskowiak Stuve (1889-1967). Cecilia is my 2nd great aunt. Her parents are Chester's grandparents and my 2nd great grandparents. They are Albert Grzeskowiak (1849-1931) and Agnes Szaroleta Grzeskowiak 1854-1918). I haven't found any evidence that Chester married or had children. His gravestone says "Dear Brother" which suggests he did not have a wife or kids. Here are some of the other photographs I found of Chester in his yearbooks. 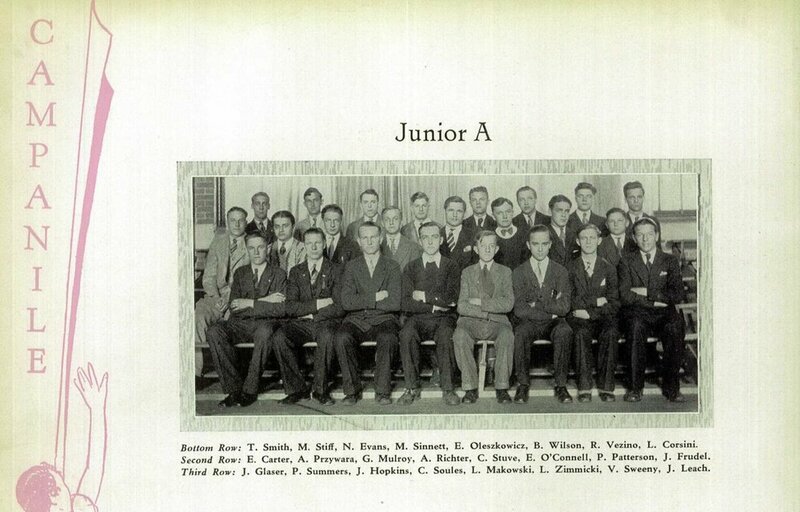 In the 1930 Holy Redeemer High School yearbook Chester is listed as a sophomore (top row, far right). 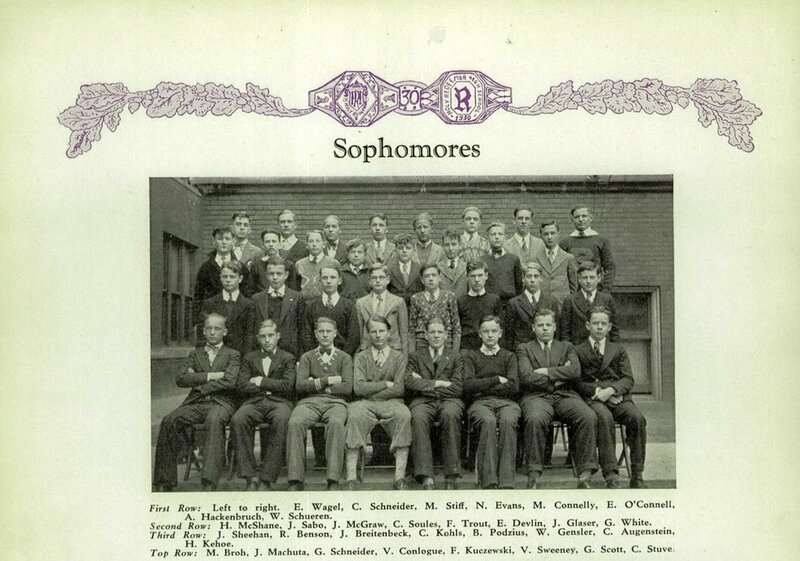 Here he is in the 1931 yearbook pictured in the junior class photo. He is in the middle row, five in from the left. 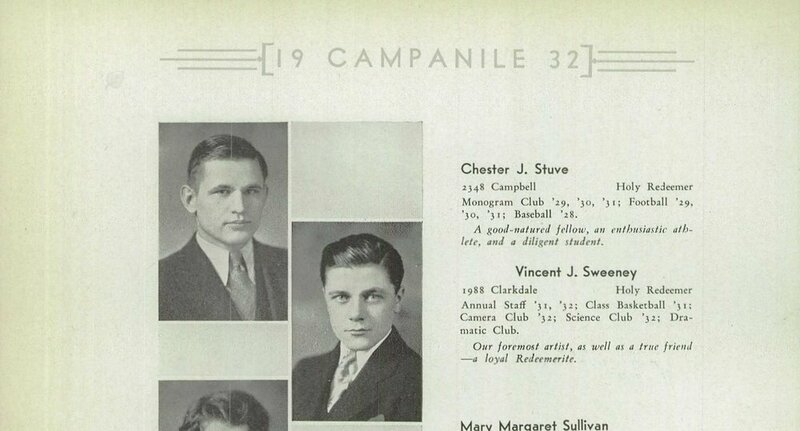 Chester was on the football team in the 1930 yearbook. Here he is on the bottom row, 4th from the left. Here he is in a group photo of the "Monogram Club" members (middle row, 4th from the left). 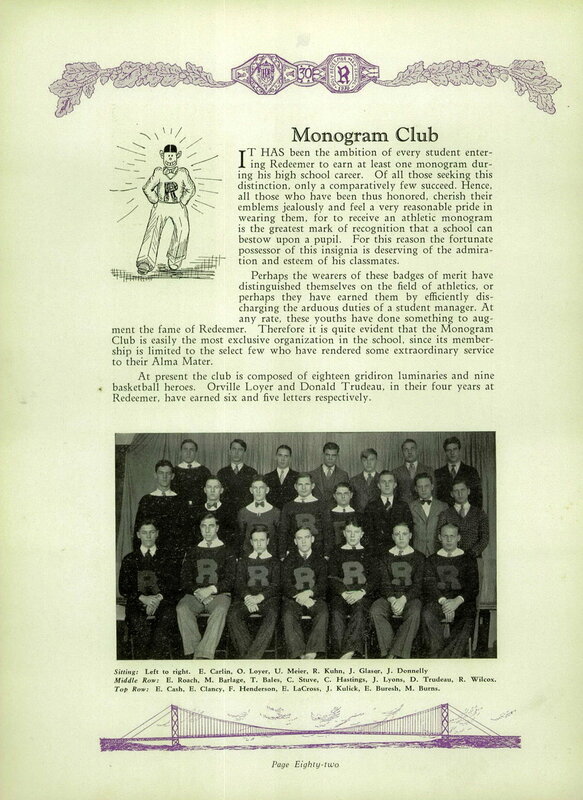 And the 1931 Monogram Club. Chester is sitting, far left. At first glance I was perplexed by this next page in the 1932 Holy Redeemer High School yearbook. It lists many of the seniors and describes there "Physiognomy", which the long debunked "science" of judging personality and character based on the shape of one's face. Yes, a pugilistic neck, a powerful man, but essentially very meek. 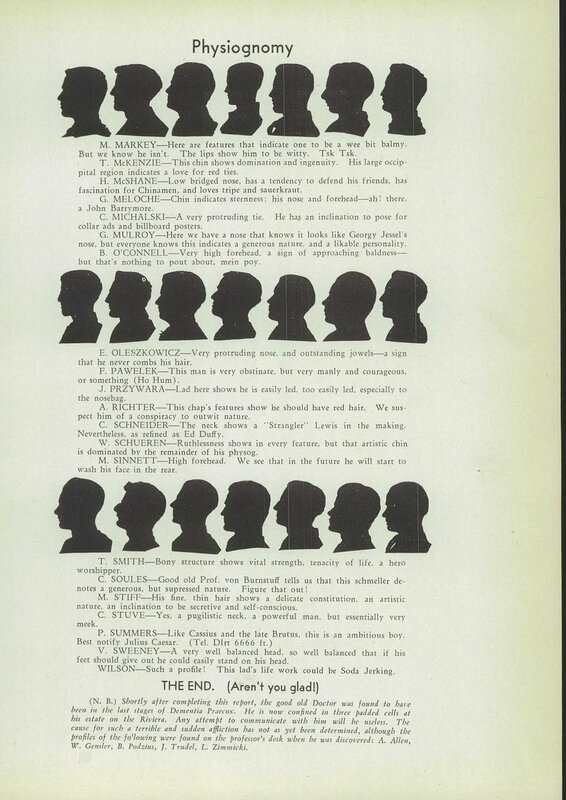 If you read through some of the other humorous descriptions, and the explanatory paragraph at the end, you will find that these physiognomy profiles are offered tongue in cheek. What are some of your best genealogy discoveries made from yearbooks? Do you want a free gift? This is the 35th of 52 weekly posts planned for 2018. It was inspired by the #52Ancestors writing challenge issued by professional genealogist, Amy Crow Johnson. The challenge: once a week, for all 52 weeks of the year, write about a relative in your family tree.